Could I, a longtime vegetarian, convince full-fledged devoted meat-eaters to try out a vegetarian/vegan restaurant? Sure. You know, once. But could I convince them that the food tasted just like their favorites from a conventional restaurant? That is, admittedly, a much tougher sell. So I decided to put Red Bamboo, my favorite NYU-area eatery, to the test. Its extensive vegan and veggie menu gives me tons of options to enjoy, but it turns out that my carnivorous friends enjoyed the dishes as much as I always do! Vegan-friendly foods aren’t just run-of-the-mill salads and bland boiled veggies — and I have the pics to prove it! I was introduced to Red Bamboo by some of my NYU classmates — vegetarians and meat-eaters alike. Since my first visit, I’ve gone back multiple times with different groups of family and friends. A glance at the menu makes you feel like nothing on the list is out of the ordinary — but actually everything offered is either vegetarian or vegan! Chicken, beef, seafood, and all kinds of specials are listed with their conventional names, but they are formulated out of meat-free ingredients. When you’re used to limited menu options, it’s almost overwhelming to be able to pick any delicious dish to try! It has been about ten years since I last tasted chicken, but the teriyaki “chicken” at Red Bamboo is just as I remember it. I usually can’t stand meat-substitutes — if I wanted my food to taste like meat, I would eat meat! 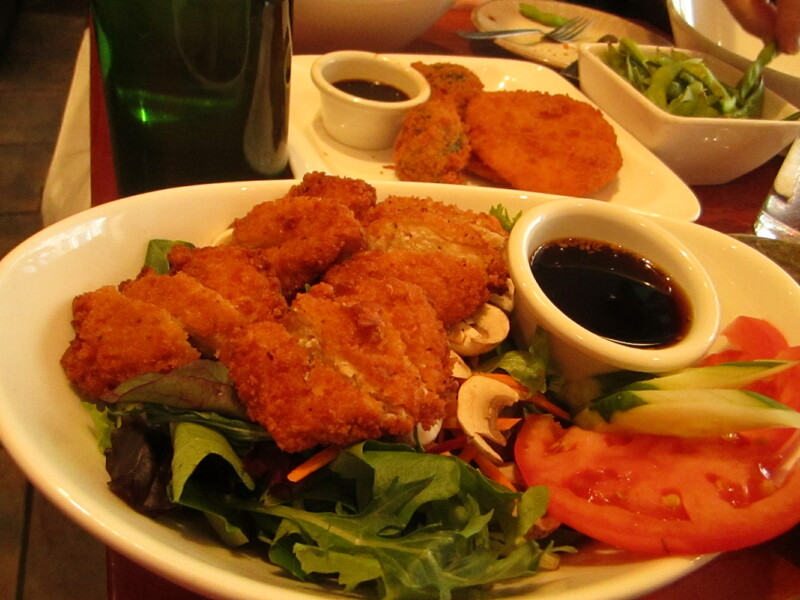 — but this blend of soy and crunchy panko crust is delicious. Even the texture of the “chicken” perfectly mimics white meat chicken that tears away in pieces rather than chunks. My meat-eating friends can spot the difference, but even they had to give it credit as being yummy. This is a great option for anyone looking to cut down on or eliminate meat from their diets — without sacrificing the tastes of their favorite dishes! The chicken products are so good that I would get them on their own, but the salad version makes it easier to fill up on leafy greens. When you’re sick of your standard boiled veggies, try them in tempura form! Seriously, the flash-fried version is so much tastier. Red Bamboo has different tempura options, but the broccoli is my favorite by far. There are so many dishes I have yet to try, and it’s mostly because I keep going back for my favorites. I also love the garlic-y Filipino fried rice special! But some of the offerings pique my interest enough to be among my next samplings — vegan shrimp? I just have to know! 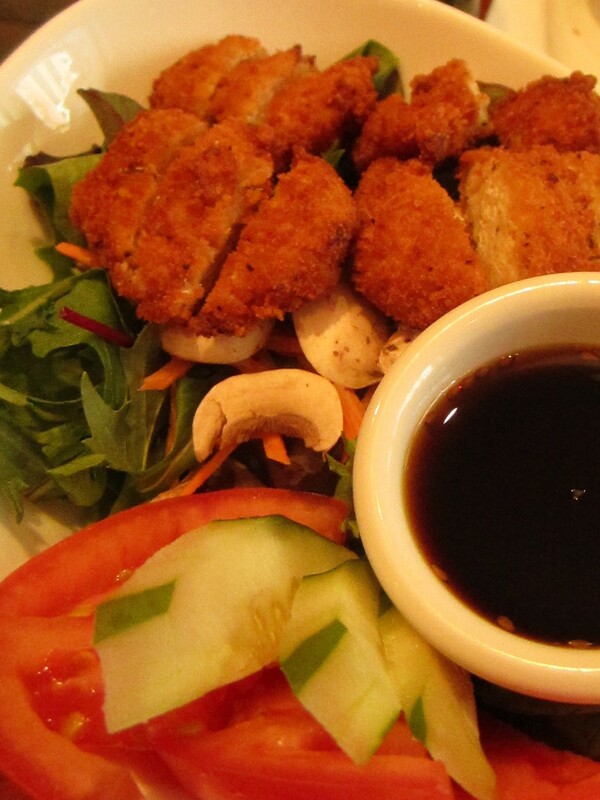 If you go, Red Bamboo is located at 140 West 4th Street, between 6th Ave and MacDougal. The eat-in area is small and is typically crowded with students later in the evening, so plan to go on an off-time or go for take-out! I tried this place and believe me, it’s worth going Vegan!